At Milton Tent Rental, we offer a wide variety of tents and party rental accessories for your events. Whether it's a wedding, corporate event, fundraiser, sporting event or even a small backyard party, Milton Tent Rental has just what you need. To compliment our tents, Milton Tent Rental also offers chairs, tables, linens, children's furniture, dance floors, red carpet runners, BBQ's, bars, lighting, and heating which allows for a complete temporary banquet facility for your event. Milton Tent Rental is proud to serve Milton, Halton Hills and surrounding area including; Georgetown, Acton, Guelph, Brampton, Cambridge, Mississauga, Oakville, Burlington and Hamilton. We invite you to learn more about our products and prices by browsing our website, e-mailing or calling. If you have any questions or would like to arrange a free consultation and site visit please contact us. My husband and I were thrilled with the service that we received from Milton Tent Rental! I had looked in a lot of places and they were the only ones that offered a package deal that included all of the necessary items for our wedding at a very reasonable rate. The owner Graham often answered my emails and calls personally. He and his staff were so accommodating and helpful throughout the planning stages. When it came down to the setup and take down of the tent his entire staff were helpful, professional, on time and efficient!! It was such a stress-free process!! I whole heartedly recommend Milton Tent Rental to everyone!! 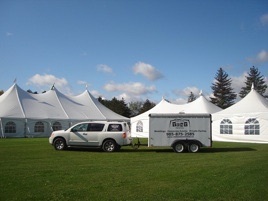 We have worked with Milton Tent Rental for the past three years on our one major fundraising event. As a non-profit organization we need to make sure that we have vendors that are affordable and reliable. We have always had great success with their services! We are looking forward to working with them again this year. Cannot say enough great things about Milton Tent Rentals. We have used them for numerous events over many years! Graham and all staff are an absolute pleasure to work with. They are always very accommodating and nothing is ever to much for them. I would highly recommend this company to anyone! We rented the tent and tables for our wedding this August 2014. They took no time at all to set up and were a pleasure to deal with. We were very happy with the service and also it was very cost effective as well. I would highly recommend them for all your outdoor events. Milton Tent Rental helped us pull off multiple events without any problems. They adapted well to any situation and always showed up on site with a smile. I would definitely recommend them to anyone for events! 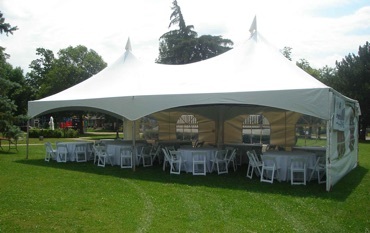 Left: 20’ x 40’ High Peak Marquee Tent for a BBQ lunch in Victoria Park, Milton. Lower left: Two High Peak Tents joined for a summer wedding at Rockwood’s wool mill ruins. Lower right: 40’ x 80’ High Peak Pole Tent and a 20’ x 60’ High Peak Marquee Tent for a high school home coming. Copyright © 2009 Milton Tent and Party Rental, Inc. All Rights Reserved.